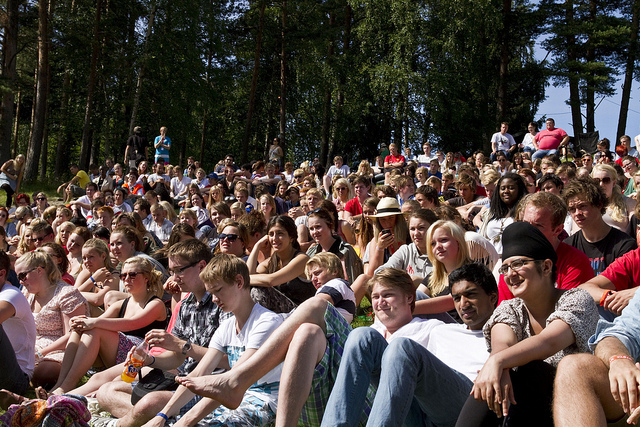 The photo shows many of the children who were participating in the youth camp on Utøya. As you know. This past Friday in Norway Anders Behring Breivik, a conservative, islamophobic and Christian terrorist, detonated a car bomb outside the office of the country's Prime Minister and other government buildings in Oslo. Less than two hours later on the island of Utøya the fascist opened fire at a political youth camp organized by the youth organization (AUF) of the Norwegian Labour Party (AP) killing nearly 70 people, many of whom were only children, and wounding many more. "You might know them as environmentalists, enviro-communists, eco-Marxists, neo-Communists or eco-fanatics. They all claim they want to save the world from global warming but their true agenda is to contribute to create a world government lead by the UN or in other ways increase the transfer of resources (redistribute resources) from the developed Western world to the third world. They hope to accomplish this through the distribution of misinformation (propaganda) which they hope will lead to increased taxation of already excessively taxed Europeans and US citizens." Considering the fact that Breivik for several years was a member of the Norwegian Fremskrittspartiet (FrP/FpU), a far-right political party that strongly push the idea of climate change being "exaggerated", the news of him being a climate denier really doesn't come to any surprise. But it does show what kind of "endorsements" other and more mainstream climate deniers have. No wonder the two conservative and climate denying talking heads Glenn Back and Bill O'Reilley tried to downplay the terrorist attack in Norway and distance themselves from Breivik. For example. In his radio show Glenn Beck likened the dead Norwegian children on UtÃ¸ya to Hitler youth. And Bill O'Reilley criticized the media for labeling Breivik as a Christian terrorist and foolishly tried to claim that such a thing was "impossible". "Although Breivik's conspiracy theories are insane, they are in line with mainstream opinion among American conservatives. He cites Christopher Monckton's speech before the Minnesota Free Market Institute in 2009, accusing President Obama of trying to cede United States sovereignty to the United Nations through climate treaties. Monckton - a rabid conspiracy theorist who claims his opponents are Nazis - was a Republican witness before Congress on global warming in 2010." If you are interested in reading the climate ramblings of a madman and a mass murderer, Brad Johnson has published the whole manifesto excerpt from Breivik's climate denying chapter here.